while you carry on as if nothing is happening, everything is. That is, as it is happening it carries you along with it. Snap your fingers and the dancing girls appear, it’s that simple. Oh, they are dancing women. Now they are men. a control freak. A control pervert. A wrong shoe on the right foot. the right side of your brain. What you think is to not think at all. don’t let it wriggle around. You are your own King, the Queen of your King. You decide what you have done. Now presses on into the future. Which you’ll never know. Everything evolves but time. Just go with it. you know how to lead. You’re a born follower, at your best. gratitude fills every boat you set sailing from your mind. what’s flying now, flying out from your dreams. some masters of the mind and soul, what is soul, is it soul-delicious? Something you can eat, digest and perfect? Or is grace ever present? As if you can force anything. “Man” ahead you say, knock it into place. to receive or open to the nothing that is there which is liberated by your own silence. What is there is everywhere as long as it doesn’t go to your head. What head, the head on your shoulders, or my head. Who am I anyway, as if saying something is my prerogative only. Larry Goodell lives in Placitas, New Mexico. He started his own performance poetry in 60's, New Mexico style. He has collaborated with artists, taught and started workshops. He emphasizes performance but promotes the poet as publisher as his Duende Press proves. His writing often generates from gardening, from word-play, from the socio-political and from his love and long relationship with Lenore Goodell. 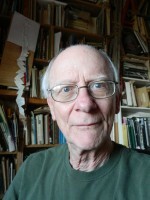 See http://www.larrygoodell.com/ and check out some of his archives at http://www.granarybooks.com/collections/goodell/.